Bottled Italian salad dressing transforms boneless, skinless chicken breasts into a flavorful main course without drowning it in fat. 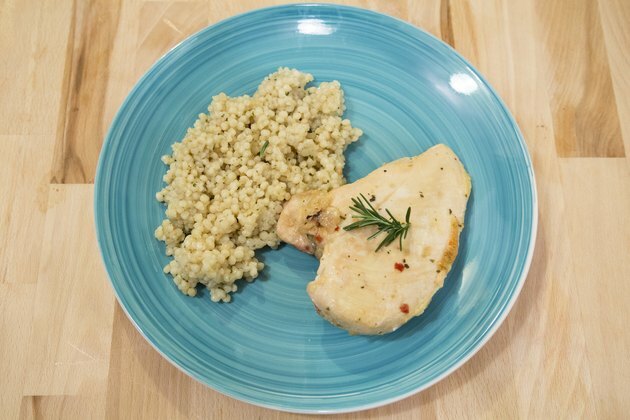 Not only is the chicken pre-cut into convenient pieces, the ready-made dressing infuses its mild flavor with a host of herbs, seasonings and a blend of oil and vinegar that might otherwise take you hours to gather and prepare. As opposed to prepping and roasting a whole chicken or making a marinade from scratch, this method can get a flavorful meal on the table in no time at all. Use the tongs to carefully transfer the chicken breasts to a large bowl, spacing the pieces out as much as you can. Shake the bottle of Italian salad dressing well and pour out the desired amount over the chicken. 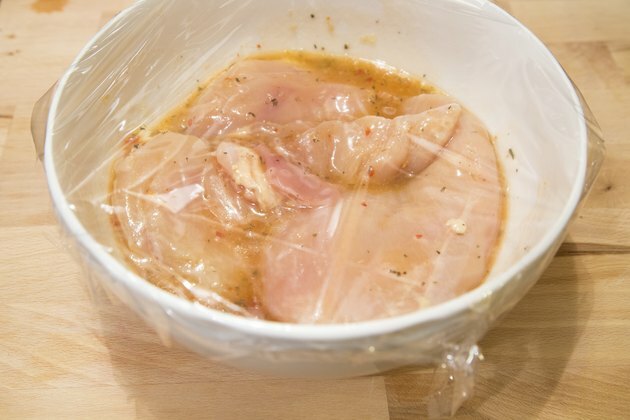 Roughly 1/2 to 3/4 cups of Italian dressing is required for 1 1/2 pounds of chicken or four medium-sized breasts. Use more or less dressing to suit your tastes. Turn the chicken pieces to coat them evenly. Cover the bowl tightly with plastic wrap. Refrigerate chicken for about 1 to 3 hours, turning every so often to ensure that both sides of the chicken are coated. 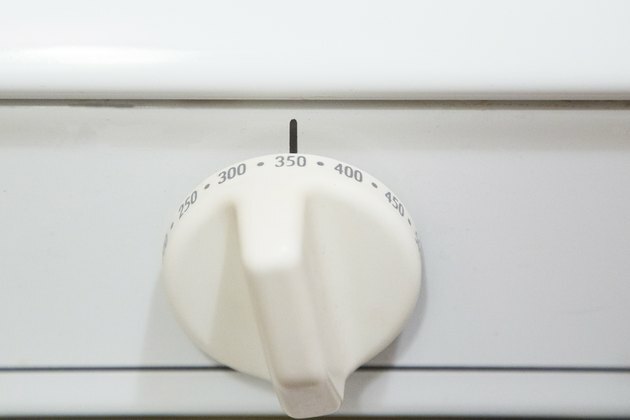 Preheat your oven to 350 degrees Fahrenheit. Coat your baking pan with cooking spray. Transfer the chicken breasts one by one from the bowl to the pan in a single layer. Do not allow the chicken pieces to touch to ensure even baking. Discard the unused marinade. 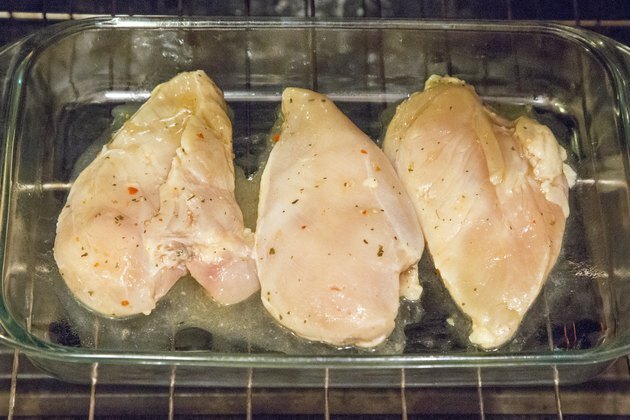 Bake chicken for about 30 minutes, or until juices run clear and are no longer pink. While Italian dressing is often used as a marinade, you can also use it to dip the chicken breasts in before coating them with bread crumbs. Flatten the breasts slightly before dredging and bake on a greased pan for about 35 minutes in an oven set to 325 F.
Saute mushrooms or other vegetables separately to use as a topping for the chicken breasts. 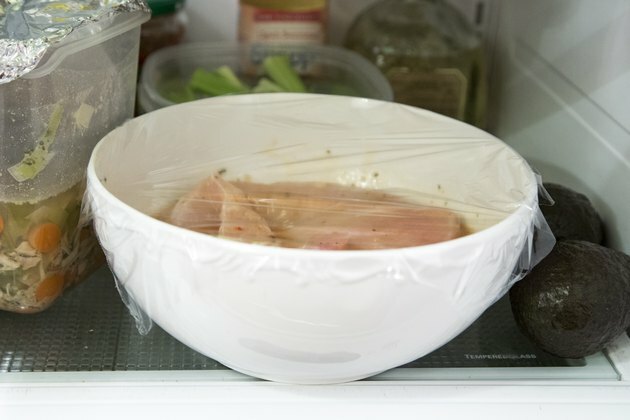 Do not wash the chicken breasts before using, as the U.S. Food and Drug Administration warns that the rinse water may splash onto other surfaces, causing cross-contamination of harmful bacteria present in the meat.